This print depicts the Sannō festival, which has been held in Kyoto and Tokyo since the end of the eighth century. An example of the incorporation of Shintoism into Buddhism, the festival developed out of the practice of Buddhist monks of Mount Hiei carrying an image of the Shinto deity Sannō with them when they presented a petition to the emperor in Kyoto. 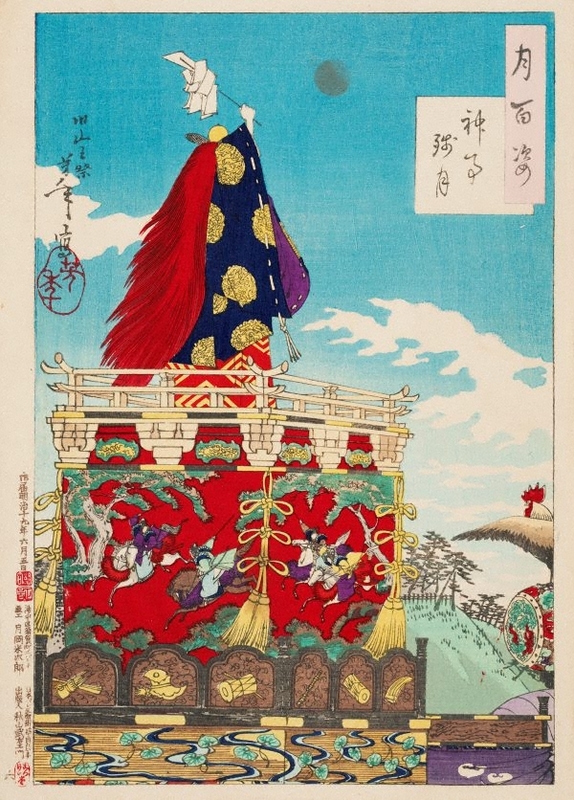 The festival features a procession of colourful floats like the one in this print. The rooster crowing on top of a drum on the right was a symbol of good government, adopted from China in 645. In ancient times a drum was beaten by subjects when they wanted to present a petition. During the peaceful reign of the legendary emperor Yao, the drum was no longer used and became a roosting place for chickens.